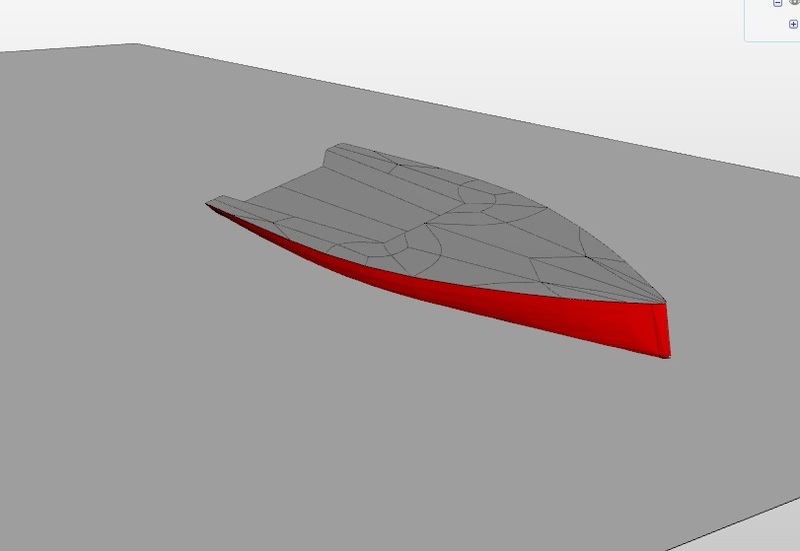 in a small side project I am looking into simulating the free surface flow around a boat hull to predict the waterline, drag etc.! First steps are done (see mesh below). 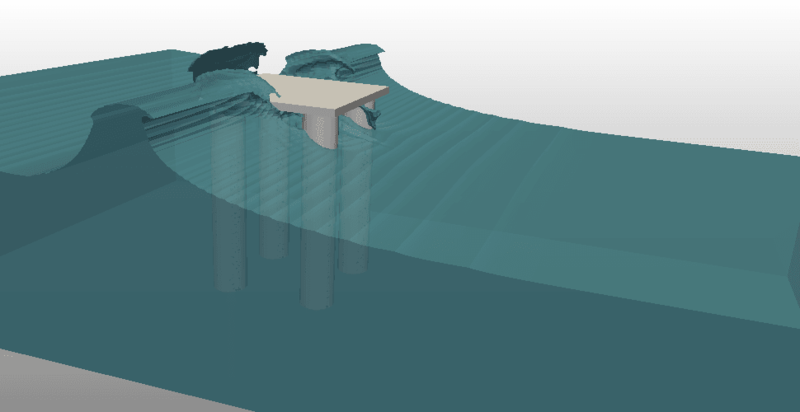 I did quite some multiphase simulation projects, but not many projects specifically for such a boat hull flow - so it would be great to have somebody else also have a look at this. Now it’s about setting up the simulation and validating the results. Somebody in the forum who wants to collaborate on this? 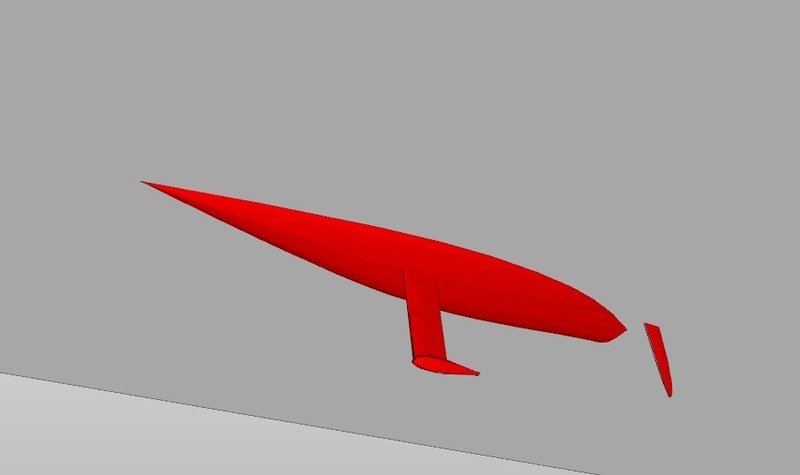 Does maybe somebody even have a background in boat hull design/simulation? It is a petty but I can’t help you. I am interesting in boundary conditions for water surface. How are you going to simulate the waves? in the first step I am only interested in a “normal” free surface flow. So e.g. the boat fixed in the middle and a free surface flow passing “steadily” at a specific speed around the hull. The main objective is to see the waterline at the hull, the steady waves created around the hull and especially the drag. If you like, I can share it with you, once it’s working! It will be great to see this project. I can’t understand why there are so big elements under the boat? Well… theoretically my education makes me yachts’ and small ships’ designer However, at the university I worked as a submersibles’ designer for few years – which means single phase simulations. But independently, together with friend, I worked quiet a lot on free surface. It started with standard flow around an object (simple shapes, ship hulls and small boats), then we added waves, subsequently deforming meshes (to simulate phenomena of ship’s subsidence on shallow water) and finally we moved to overlapping meshes and physical movement of an object. So, if your aim is to try to predict a drag I think I can help. Or at least I’ll try. Especially that I have this kind of a simulation in my plans anyway. I just want to finish my single phase simulations first. Maybe at the beginning please write questions and concerns you have and we will try to work it out. That will be easier. @Maciek, awesome! I am right now waiting for my current simulation to finish (takes quite some computing time these multiphase flow simulations … ) and I’ll then get back to you! Thanks for helping! Hi dheiny, I have strong interest in this case and want to collaborate (if possible). 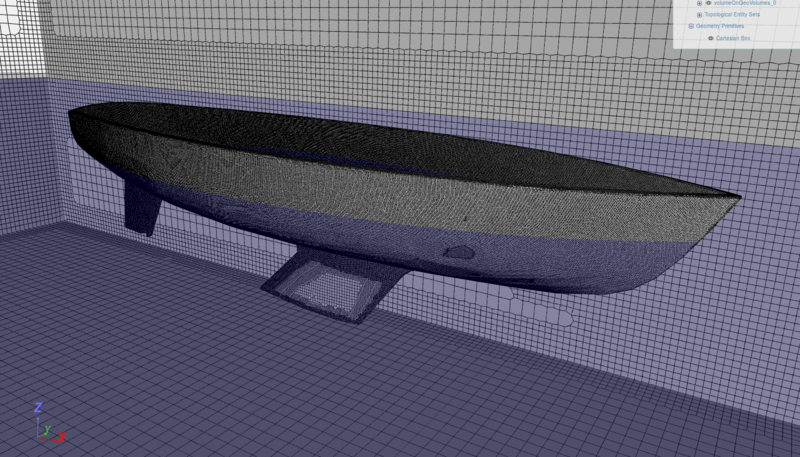 A few suggestions on your simulation: your hull is too much immersed under water surface. As a roughly guide, water plane should pass through the inflexion point at the bow. Another important feature to include is heeling angle. Most of the time a sailing yacht will sail at a heeling angle, particularly when she goes against the wind. Normal angles can vary from 5 to 15 degrees. I can provide you many geometries in .step or .iges format for you to include in a simulation tutorial of sailing/motor yacht hulls at different displacements and heeling angles. I think calm water and steady state (fixed velocity) is a good starting point for this kind of (heavy) simulation. looking forward to collaborate! The boat in the image is simulated at 1 degree heeling angle, but it’ll be fairly simple to increase it to a larger value. Thanks for the hint with the water surface level - will take care of that as well. I paused the project for a while as I was waiting for some new functionality on SimScale, making such a simulation easier to set up, which just became available. So I would now continue to work on it. How about we use one of your geometries? A STEP model would be great. If you upload it to a SimScale project and share it with me, we could work together on this. I see now that my limit of storage for my free academic licence in Simscale is just 2MB, perhaps that’s the reason for the low quality of my .step file? It looks pretty poor on Simscale, while in other softwares it looks better. The academic plan comes with a much higher storage limit (50GB, see the academic plan on https://www.simscale.com/product/pricing/), so this should not be the reason. 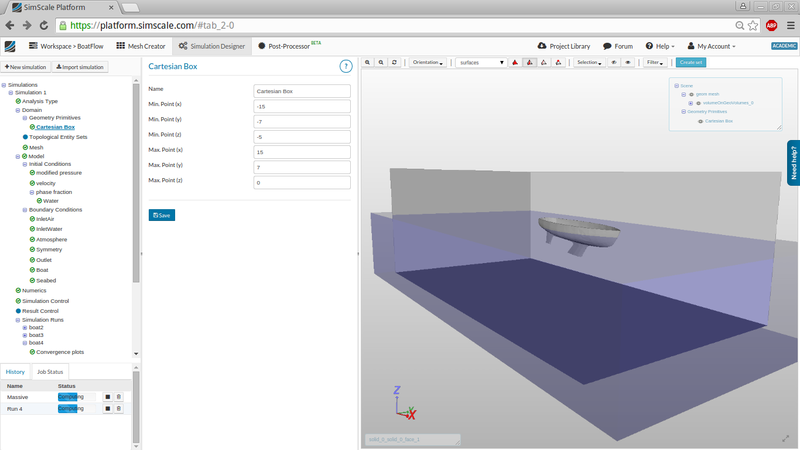 SimScale uses the native data you provide (in this case, the STEP file) for downstream processing (e.g. meshing) so the “data quality” is not changed withing SimScale. 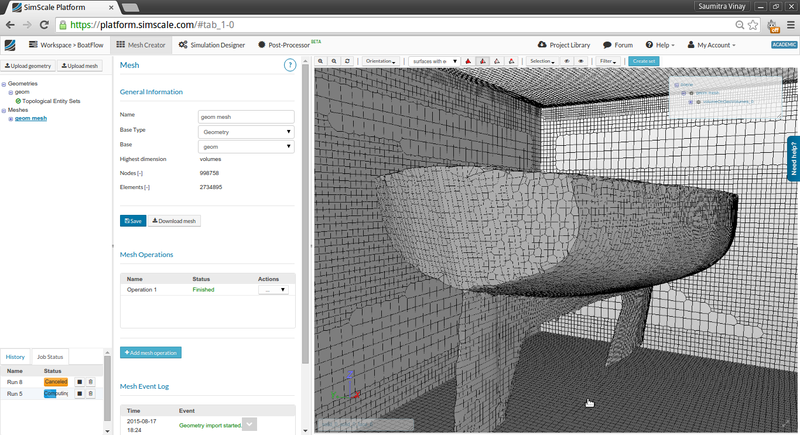 Depending on your CAD system, what can happen is that the STEP export does something unexpected (e.g. check on @BenLewis’s post). What exactly do you mean by poor? The tessellation of the surfaces? That might be due to optimization methods we are using to accelerate loading and interaction - but it’s just related to visualization. Thanks for sharing the project, will look into it this week and get back to you. Once we are done, would you be fine with putting it as an example in the SimScale library? If yes, we could ask @sjoshi if he would like to join this project. He is currently working on a similar project for the library and it might be a piece of cake for him to set this up. It would be great to have this simulation as a part of the library! In case you would like to publish this project, or have any issues with the simulation, please share the project here. Meanwhile, like @dheiny said, I’m working on a similar project. As soon as I have some results, I’ll update here. @sjoshi, it will be nice if you can join this project too. I’ll be glad to see this project in the library, you can use the geometry freely, it’s of my own, so no copyrights involved. Any tips on how to define the 2 phases? @dheiny, seems like something happened with my account when I subscribed to the forum, now it is a basic account and no longer an academic one… can it be fixed? It will be great if Simscale accept .iges files, they are easier to handle. Must the water plane go into the hull? My waterplane is cut by the hull skin, it has a hole where the hull lies. I don’t know whether is it right. I’ve seen many simulations where waterplane goes into the hull. Must the hull be splitted by the waterplane? Mine isn’t. Thank you! I’ve requested access to your project from @dheiny, and will begin work on it soon. Meanwhile, I’ll try and address some of your questions. seems like something happened with my account when I subscribed to the forum, now it is a basic account and no longer an academic one… can it be fixed? Log in to your SimScale account. Click on Upgrade Plan button. This will take you to a new page. From the two tabs (Commercial and Academic), select the Academic tab. You should be able to select the Academic Plan then. In case the problem persists, @agata could help you out. How it works is, in the Phase Fraction part of the Initial Conditions tab, we switch to Subdomain-based option. Then, we specify the Default Value of the phase fraction. This initializes the entire domain to that value of the phase fraction (say 0). We can then use a previously defined Geometry Primitive (lets say we use a Cartesian Box), to initialize only that part of the domain which is occupied by the box to the other phase fraction value (in this case, 1). You are right, it is not exactly how one would want their boat to sail as , and we are looking at introducing more specific ways of initializing the domain in the future. But I think it does not affect our simulation to a big extent. This is because we are not including Fluid-Structure Interaction, and hence presence of water in the boat does not affect the buoyant forces on the boat. It does change the movement of air inside the hull cavity - which can be safely ignored if the focus is on drag and wake studies on the outer surface of the boat. One workaround could be to fill the inner part of the boat with solid material, so that it is not counted as a part of the domain. @quequen, I checked you account history and it seems you just subscribed to the premium test on August 1st. Feel free to upgrade to Academic anytime and enjoy the full power of SimScale! Let me know if you have any trouble. thanks @vdoelle1, @sjoshi, I updated my account to Academic. Have you considered to save a small tutorial to explain the settings? Can the Documentation be downloaded as .pdf? @quequen, I am currently in the process of wrapping up the simulation in a state that can be shared. Once that is done, I will share the simulation here and it can then be imported in your library. We have some results: the geometry for now is the original one that @dheiny used. It was initially refined to a high level of detail, but the element size there was too small for the simulation to finish stably in reasonable amount of time. So the mesh was coarsened a little. The boat sails at a speed of 2 m/s, and I ran the simulation for about 38 seconds of simulated time. Here is an animation of the interface. We can clearly see the formation of a stable wake over time. Are this values close to reality? Transverse wave system seems ok, however I would expect a divergent wave system more clearly visible. Perhaps domain width is too small? Why are the highest waves flattened on their crests? I think I’ll wait for your simulation to be finished before making more attempts with mine, too many things to learn yet !.